Europe will continue to see substantially higher energy prices than the US for a prolonged period of time – at least that is the verdict of Fatih Birol, chief economist of the International Energy Agency (IEA). This, the IEA argues, is mainly because of differing geological conditions. Even if it wanted, Europe could not easily escape the cost disadvantage by aggressively pursuing domestic production of oil and gas. The analysis that the extraordinary natural gas resource endowment of the US, and that the high cost of transporting gas across the Atlantic might lock-in price differentials for years to come, is convincing. However, there is still a possibility that (some) price convergence might kick-in, as quickly as the unexpected price divergence occurred in the past decade. Because of high gas prices, energy consumption could threaten to move elsewhere, and could be reduced by energy efficiency investments that become profitable because of high energy prices or substituted by other forms of energy (renewables, coal, etc.). This might force Europe’s major suppliers (Russia, Algeria, Norway) to rethink their pricing strategies for their primary market. That is, before accepting a collapse in gas demand, the major suppliers might find it wiser to reduce gas prices to a level that stimulates enough demand in Europe. Whether or not gas import prices will be re-adjusted in the medium term, European politicians are eager to show their willingness to act on the perceived imminent energy competitiveness threat. In a recent chapter [‚Manufacturing Europe’s future‚] we argue that energy prices are only one of many factors determining the competitiveness of a country. Consequently, a fiscal fix for the energy competitiveness of energy-intensive industries is probably counterproductive. Based on the exporting behaviour of 27 OECD countries over 15 years, covering 2800 products, we found that countries with low energy prices are indeed better at exporting energy-intensive products. However, countries with high energy prices find opportunities for exporting other products. Overall, the products disproportionally exported by high energy-price countries generate more jobs and higher value added than the energy-intensive products exported by low energy-price countries (‘Laser, light and photon beam process machine tools’ vs. ‘Ammonium nitrate fertilizer’). 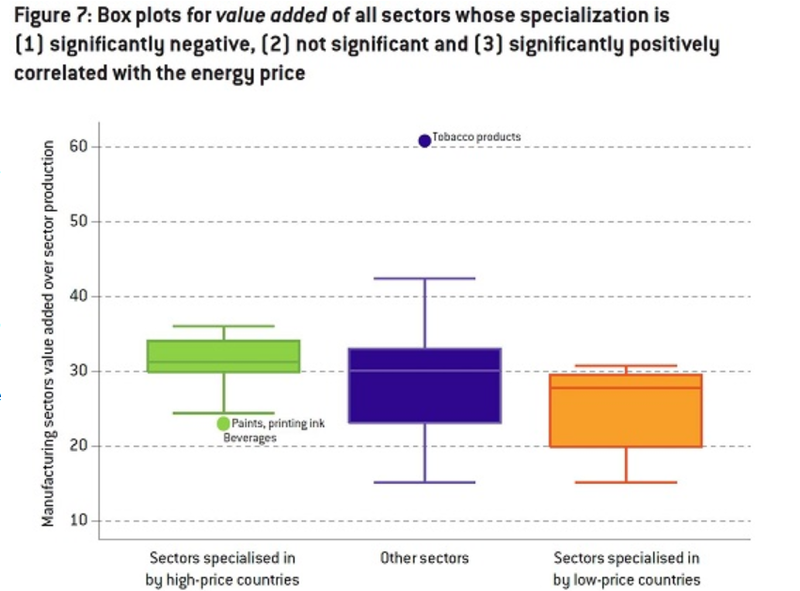 Furthermore, we found no evidence in high energy-price countries for a knock-on competitiveness loss from energy-intensive products to products further down the value chain (e.g., aluminium -> cars). Consequently, supporting energy-intensive industries at the cost of non-energy intensive industries risks destroying more jobs and value added in the latter than it creates in the former. This does, however, not mean that politicians should sit on their hands. There is significant untapped efficiency potential in the energy sector. For example, investment in energy generation should be more based on market forces, the investment in and operation of European network infrastructure should be Europeanised and energy price regulations should be abolished. Furthermore, Europe should improve the efficiency of its climate policies by revamping the emissions trading system and refocusing renewables support on making renewable energy technologies competitive with fossil sources (instead of massively deploying not-yet-competitive technologies). This& might allow achievement of our long-term decarbonisation goals at substantially lower cost. Even though Europe might have to live with higher energy prices than the US, it does not face a trade-off between remaining competitive and becoming sustainable.